And that is why he always credits the whole team for their wins- cuz he is a class act! At least none he got caught at! The Steelers were magical during those years. Pittsburgh was a fun place to come of age in the 70's. 13 points isnt exactly what you would expect from an HOF QB. 10. And that is why he always credits the whole team for their wins- cuz he is a class act! still doesn't have any class. 7. At least none he got caught at! 5. The Steelers were magical during those years. 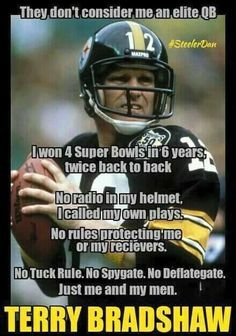 Let us never forget that it was QB's like Bradshaw that helped fight for the rules to protect players frrom crippling injuries and life debilitating injuries! Brady is still in a league of his own! and went public about it to try and eliminate the stigma. But his stats still don't add up. And Brady constantly calls many of his plays! Just compare the two side by side!